I arrived at Milano Centrale, the main train hub in Milan, at 10:00am with every intention on taking a 10:25am train to Como where I planned to hop on a hydrofoil from Como to Bellagio. The hydrofoil is a passenger-only ferry that travels amongst the lakeside towns along Lake Como. I waited in queue, gave my best, “Buongiorno! Parli Inglese?” (Good morning, do you speak English?) to the representative and he replied, “a little”. I briefly explained the ticket I wanted to purchase to Como to which he replied, “There’s a strike today the next train Como departs at 5:45.” His thick Italian accent added to the disappointment and my heart abruptly sank. I, obviously, ran and didn’t walk to the machine where my ticket to Como from Milano Centrale was 7 euro and 80 cents. I’ll never know how much extra I spent that day – but for less than 10 euro, I surely didn’t care. 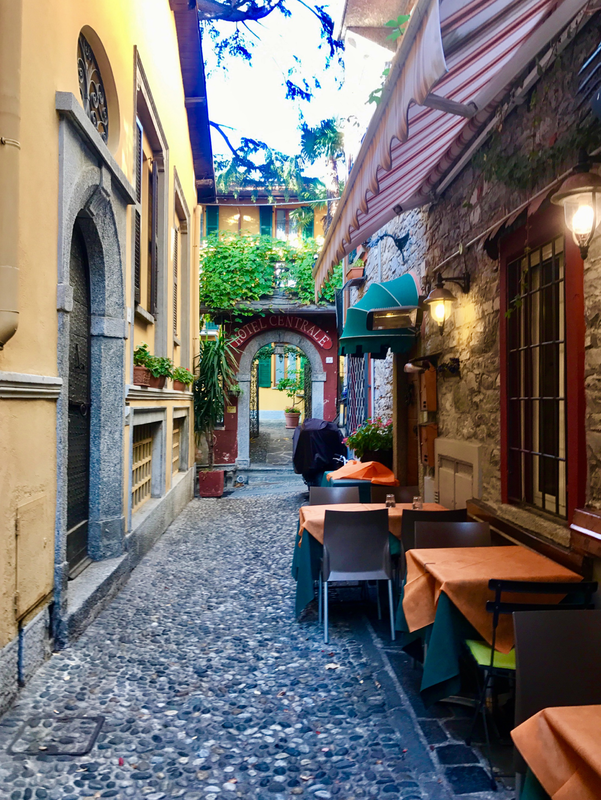 Como has been synonymous with luxury and relaxation since Roman Times when nobility of Rome escaped the summer heat and humidity to summer around the lake. I really can’t blame them. I mean, this is after all where George Clooney decided to purchase a vacation home. Some of the walking streets through Bellagio, as pretty as a picture! Even from the train station, typically a less-than-desirable area in Europe, Como was gorgeous. The trees had just begun to change and although I wasn’t going to be able to experience the lake in the summer – beating the crowds was worth sacrificing swimming. The taxi from the train to where the hydrofoil departed was about 8 euro and with my large luggage in tow, it was totally worth it. I then purchased a one-way hydrofoil ticket from Como to Bellagio for 14 euro 50 cent (bringing my grand total of travel from Milan to Como to Bellagio to just over 30 euros, hardly anything to complain about). 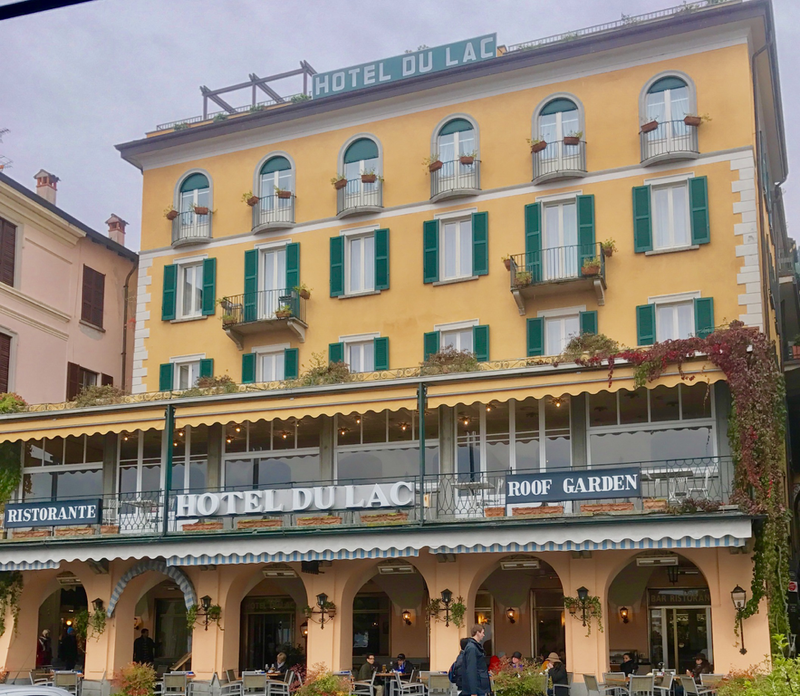 I was fortunate enough to be checking into Hotel du Lac in Bellagio, quite literally a hop and a skip across the street from where the hydrofoil drops the passengers off in Bellagio. 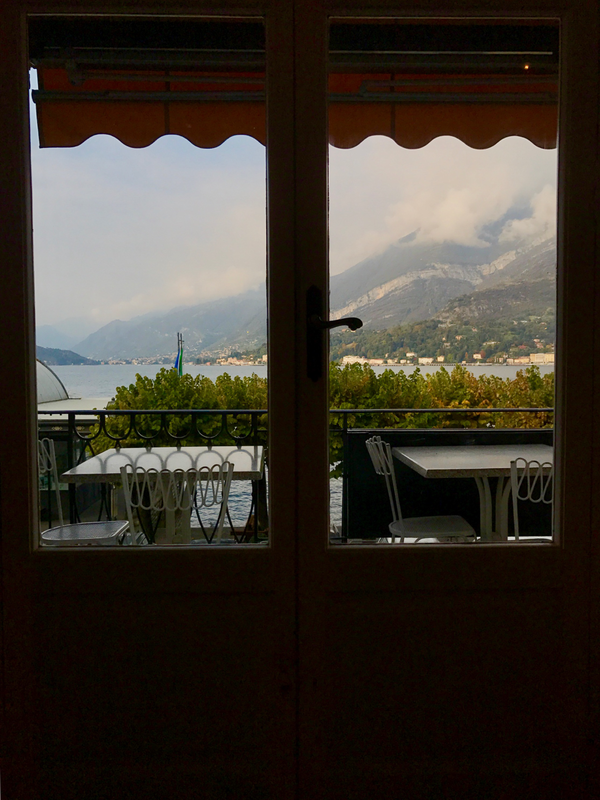 This, extremely centrally located, three-star property is ideal for those who might be looking to visit the lake on a bit of a budget, without sacrificing the luxury and service that Lake Como is notorious for. Although rated only three stars, you can see that you’ll hardly be sacrificing with these accommodations! Hotel du Lac is rated three stars, yet I received five-star service from all the employees – upon check-in I was given the wifi access code and a discount card to receive 10% off when dining at the restaurant housed inside the property. Everyone was extremely accommodating at Hotel du-Lac, even the woman who cleaned my room apologized (for doing her job!) when I went back up to my room to grab an extra battery for my camera. The wifi was surprisingly strong! An amenity that often goes overlooked. My room also came equipped with a small television and some toiletries in the restroom including soap, shampoo, lotion and a hair dryer. A continental breakfast was also included with the room and the view from the breakfast area was simply stunning! A table for one, with a side of a Lake Como view, please! The view overlooking the lake from the breakfast area at Hotel du Lac. Forgive me for stating the obvious, but this is a walking town, and I can’t suggest getting lost in the alleyways and small streets of Bellagio enough. I chose late October as my time to visit (perfect timing for off-season travelers looking to get away from the busy summer crowds) and I couldn’t have been any happier with my decision. The fall foliage was in full force and every corner of Bellagio was bright with autumn hues. Even though the weather was a bit dreary, overcast and drizzly – I found myself roaming the streets with a smile from ear to ear. Just after sunset looking over the village of Bellagio. The infamous “Bellagio street” that you can’t leave the village without snapping a picture of! In its true glory with hardly any tourists and beautiful autumn colored vines. 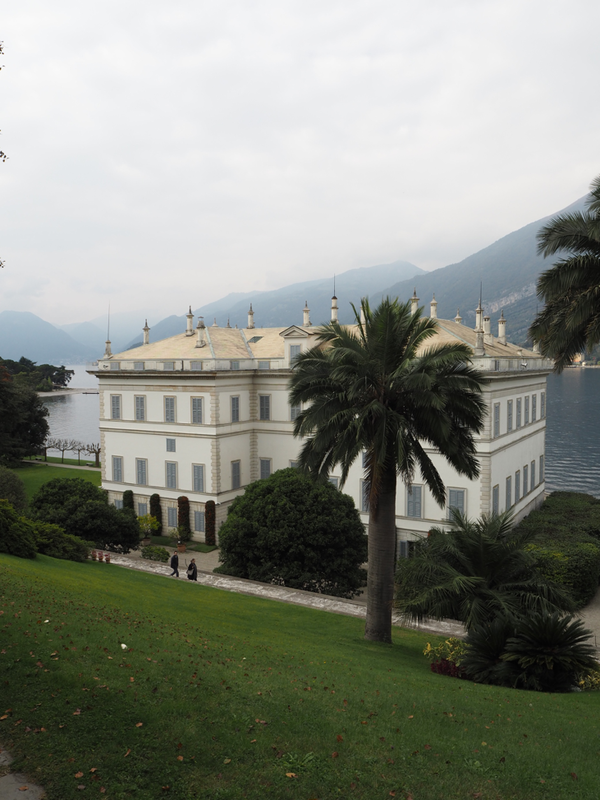 Bellagio is home to two Villa’s with gardens that are open to the public – Villa Melzi and Villa Serbelloni. Unfortunately, I arrived just a day too late and Villa Serbelloni had been closed for the season. However! 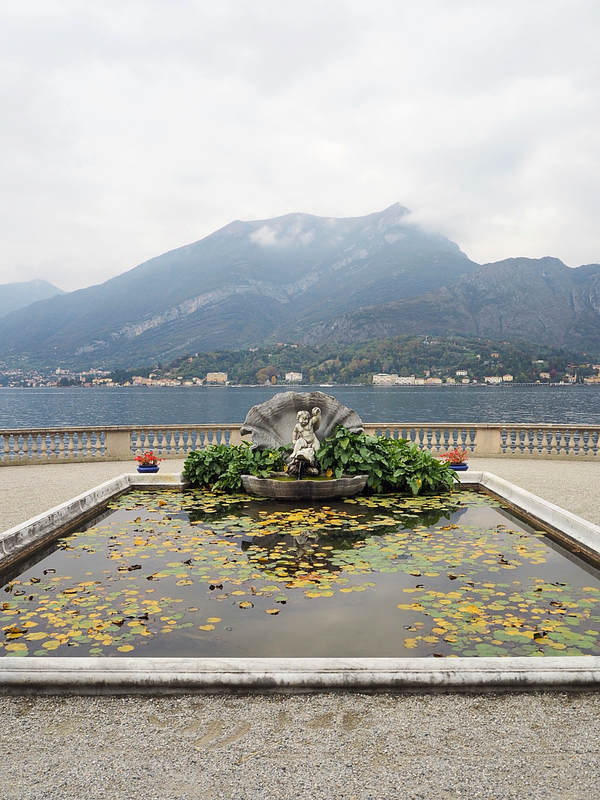 I had a guided tour through the Villa Melzi gardens and I was blown away by the beauty of the grounds – and of course the extravagance of the gardens. Villa Melzi was once home to Francesco Melzi d’Eril, a Vice President under Napoleon’s first Italian Republic. So, it’s safe to understand why the property is so opulent. 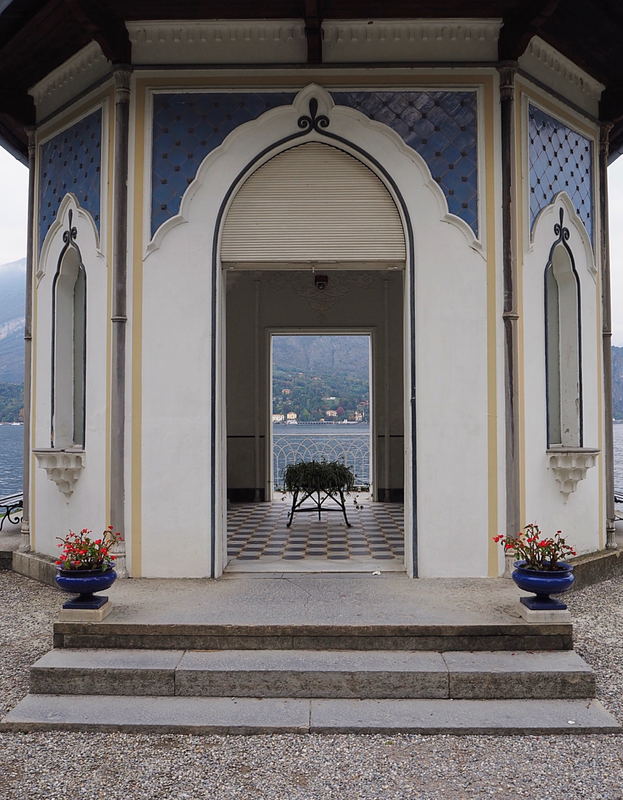 One of the first buildings you stumble upon when visiting Villa Melzi. The Villa Melzi Villa itself is closed to the public but still stunning to see, nonetheless. 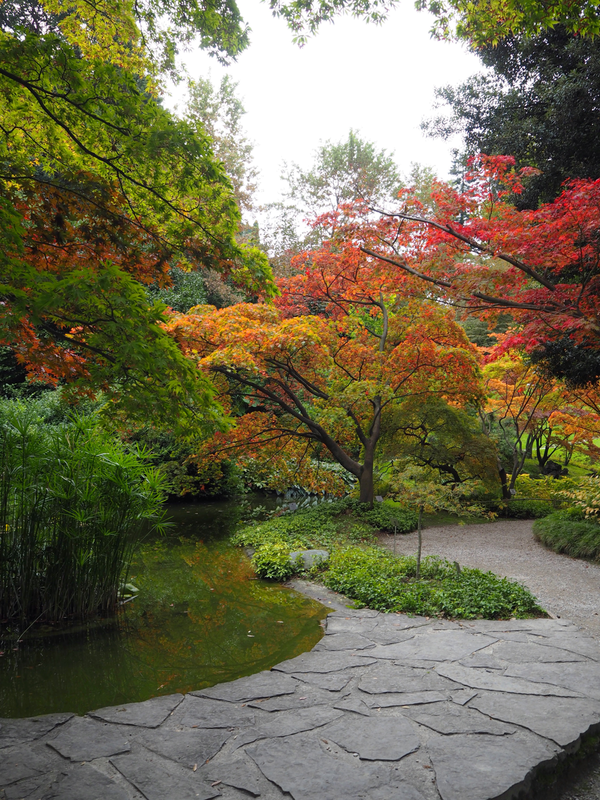 The extravagant gardens beautiful in their autumn attire. A reflection pool directly in front of the villa, right along the lake. 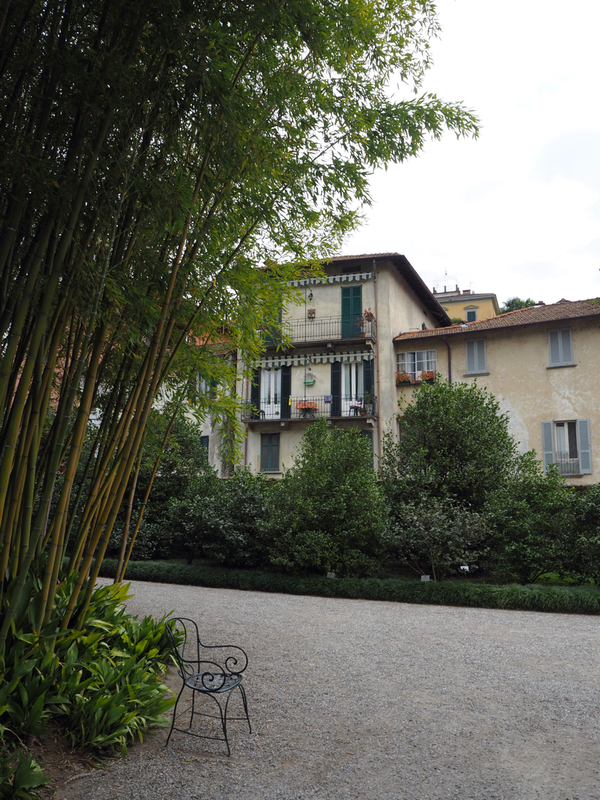 Bamboo is the last thing you’d expect in northern Italy – so of course, Villa Melzi had bamboo (along with dozens of other imported trees, shrubbery, flowers and greenery). 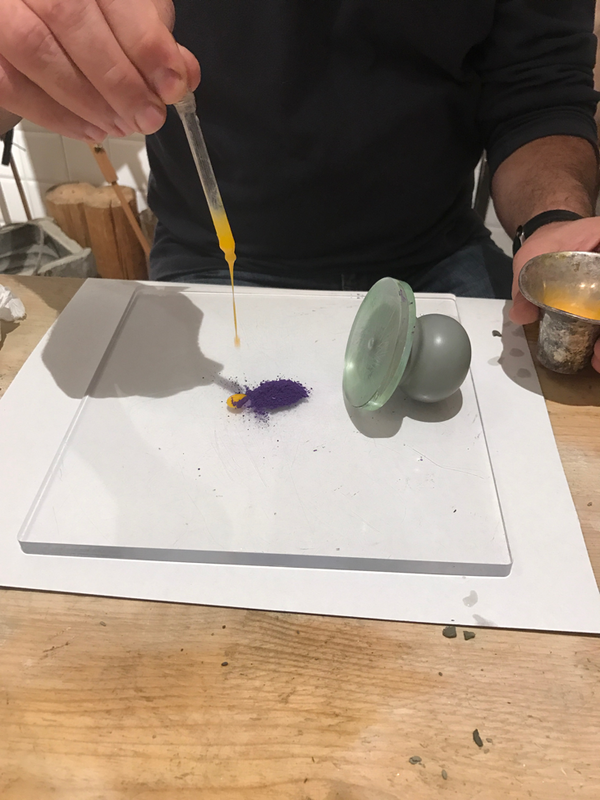 One of the best (and most unique) experiences I had in Bellagio (or in all of Italy for that matter) was my art experience at Abele Experientia Artis. The evening I opted to get hands on with an art class at Abele, it happened to begin to rain, a sign from the universe that I made the right choice! 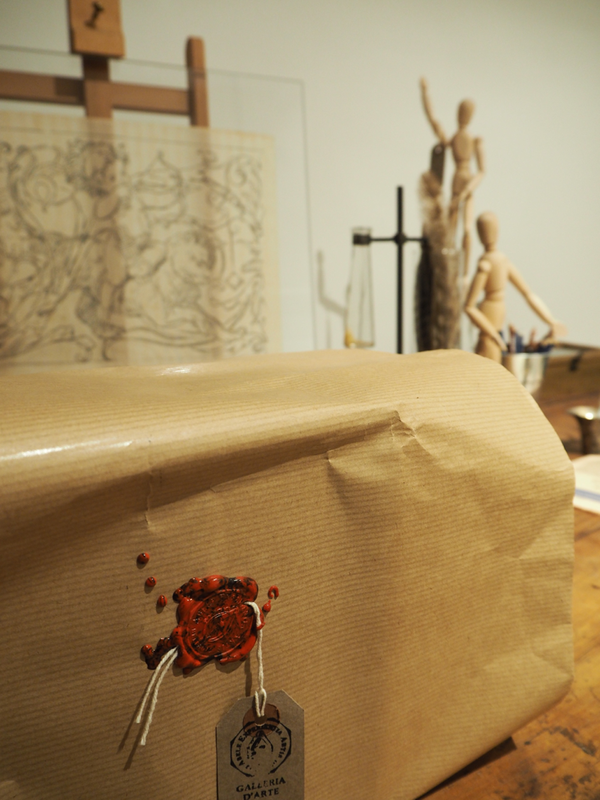 I was greeted by Francesca, the studio assistant, and warm smiles from two other students and the artist. 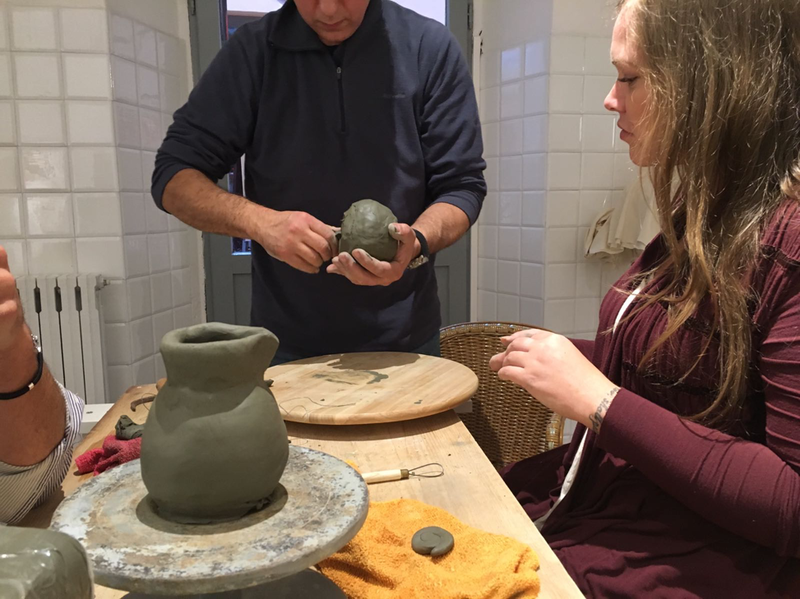 I was going to be learning how to make a clay pot as well as a watercolor painting (using traditional and ancient techniques!). 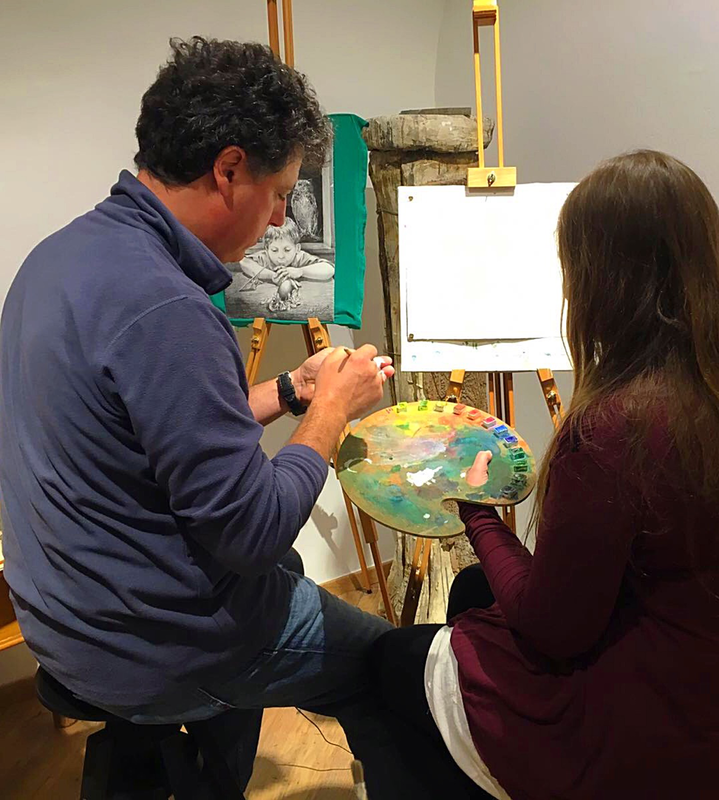 What’s awesome about Abele Experientia Artis is the vast amount of classes they offer – from lakeside painting to kids classes and everything in between! The small attention to detail, such as the wax stamp to hold the label on the packaging, was something truly unique and special. I couldn’t help but be amazed at the sculptures, paint pigments, tools and more on display at the gallery. 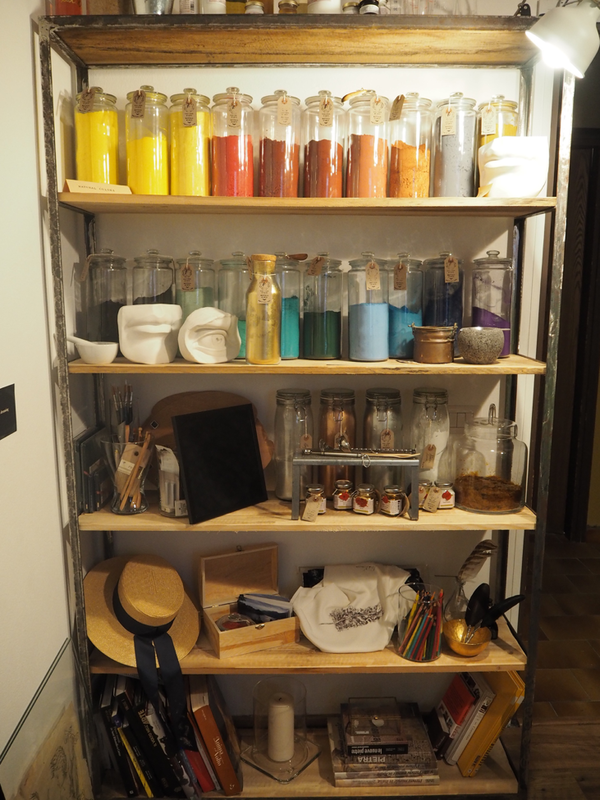 Some of the paint pigments and different tools on the shelves. 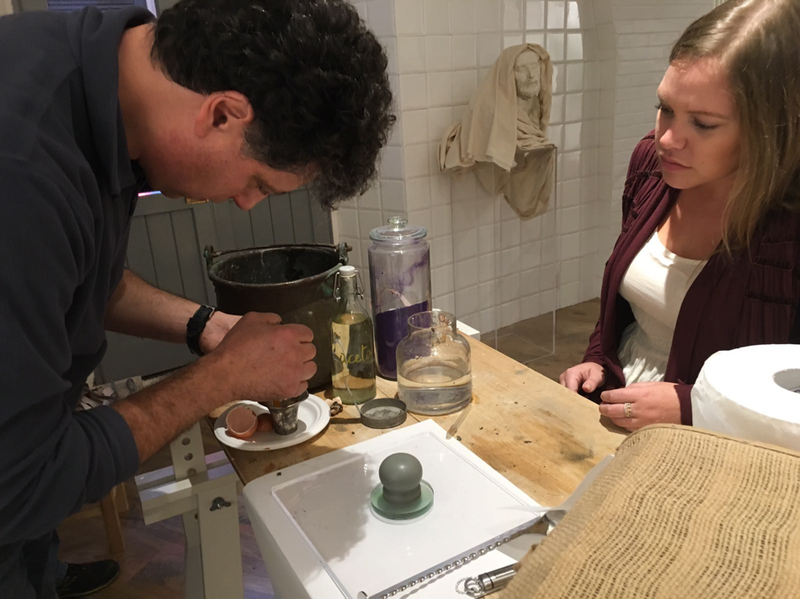 First, we went to tackle the fine art of turning a blob of clay into a pot – which I subsequently failed miserably at. Molding clay is much more difficult than it appears to be! 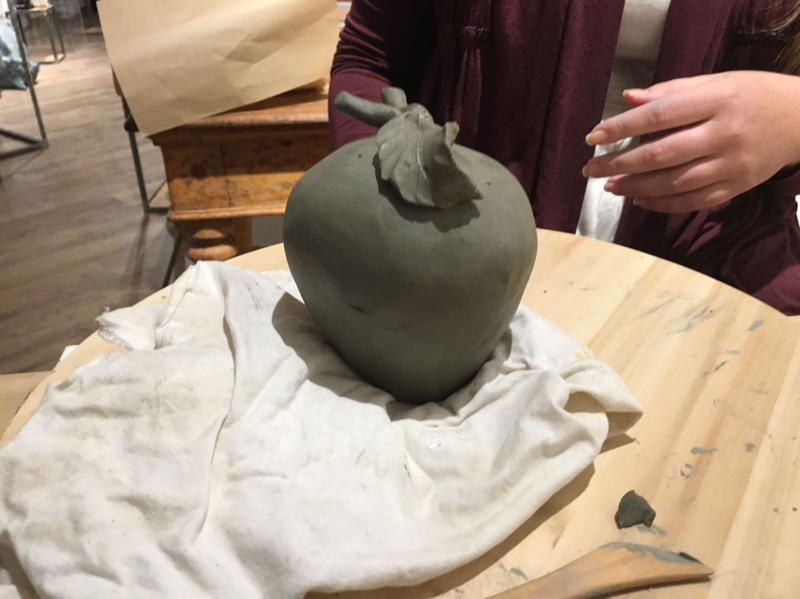 I tried to learn the techniques but it appeared that my hand-eye coordination just wasn’t there so being that I’m from New York – we promptly turned my clay “pot” into a clay apple! Here I am attempting to learn how to mold clay properly. And here’s my work of art, a clay apple, after we came to the conclusion that a clay pot just wasn’t going to happen. Another one of the techniques I learned was turning pigments into paint. This is done by a process of adding egg yolks and vinegar to the pigment and then grinding the pigments down. I also learned that prior to the discovery of adding egg yolks to pigments – paint wouldn’t stick to the canvas, paper or wall that it was being applied to #TheMoreYouKnow. Watching the egg yolk daintily (as to avoid any egg white from getting in the mix) get mixed with vinegar for our pigment. 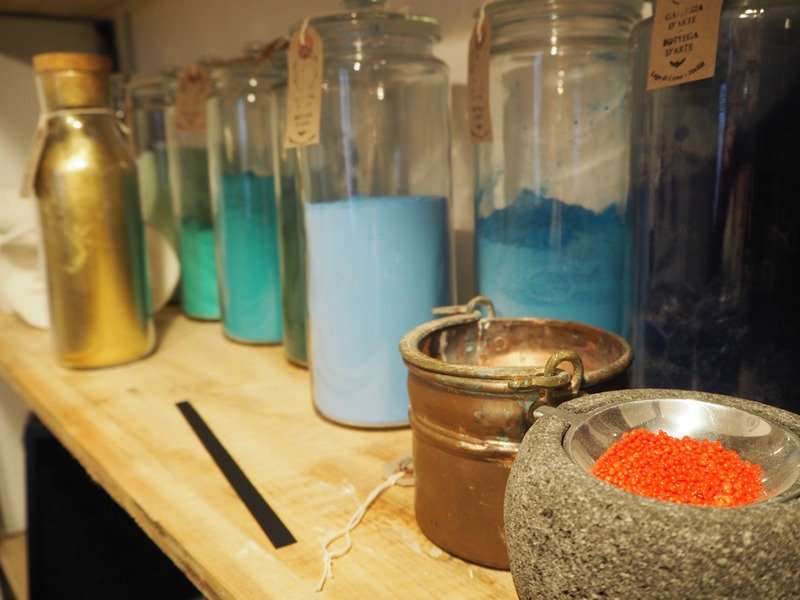 The yolk and vinegar was then added to the grainy, dry pigment and we crushed and mixed it until we had paint. It was then time to paint! I felt like a real painter complete with my easel and artist’s palate. I’m smiling so big because I had a TON of assistance with this painting. La Punta Ristorante is a sophisticated option, located right on the water. 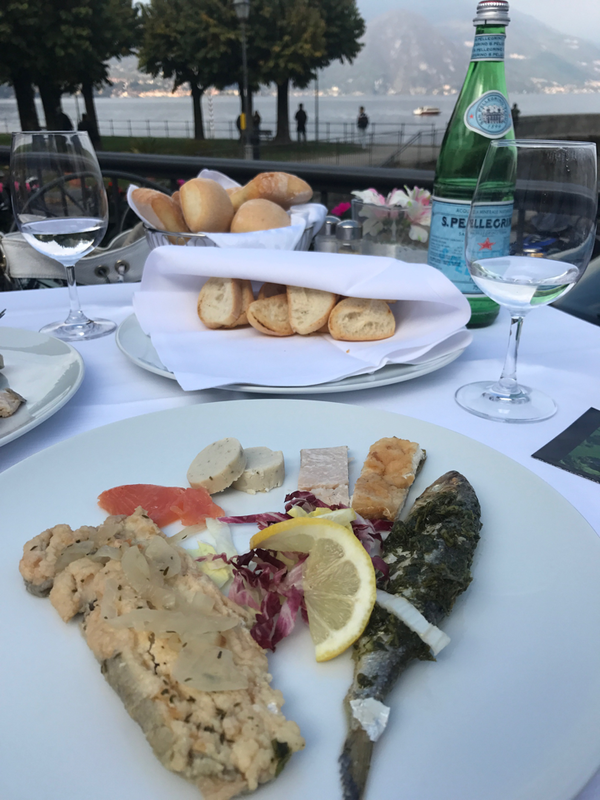 I tried a little bit of everything starting with an appetizer that had an assortment of differently prepared fish, some caught from the lake that same day! You can choose from an assortment of imported or Italian wines and sit back and enjoy the view while you eat. When I said I tried a little bit of everything, I wasn’t joking! Grand Hotel Villa Serbelloni has two dining options – Mistral which even has a Michelin star (and also had been closed for the season upon my arrival) and La Goletta, a less formal dining option – both of which are open to the public, with reservations. I had the pleasure of dining at La Goletta and was surprised that some of the options from Mistral – which specializes in the science of cooking – were on the menu. After my meal of pizza, pasta and beef I was served fresh ice cream that was prepared right in front of me using fresh cream and nitrogen to make it icey! It put on a show in front of the whole restaurant (and I’m sure that almost everyone who saw the preparations went on to order the same! 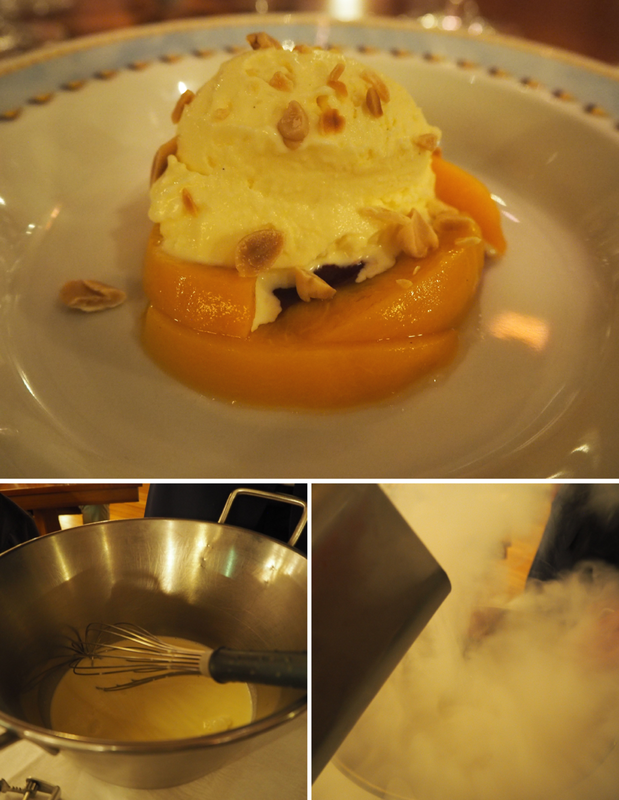 Top: My vanilla ice cream served over candied peaches and topped with nuts. Bottom right: The liquid cream that was brought to the table. Bottom left: The nitrogen steam that was whipped into the cream to turn it into ice cream. Bellagio is hands down the prettiest little village I’ve ever gotten lost in while in Italy. I can’t suggest adding this town to your Lake Como itinerary enough! From the quaint streets to the smiling faces on the locals to the delicious food and unique history and culture, it’s the perfect place for a weekend getaway. I’d also highly suggest visiting during off-season as I can’t imagine the tiny streets packed with tourists. *Disclaimer: I was hosted in Bellagio as a guest by Promo Bellagio, a tourism office representing Bellagio. My opinions, as always, remain my own. This looks like so much fun!! Your photos are amazing! This looks like such a fun place! The art experience looks like my kind of activity and sounds awesome. Wow, beautiful pictures. The street looks like it’s out of a storybook. Bellagio sounds like fun. Do you recommend any particular season to visit? I, personally, travel in the off-season – everywhere I go. It was wonderful in mid-October but hotels and restaurants were already starting to close so perhaps late-April/May or late September/early October. I have always wanted to visit Italy (I studied Italian for six years too!) but as yet I haven’t made it there. I don’t know much about Lake Como – apart from George Clooney – but your photos are reason enough to add it to my itinerary when I do visit. Thanks for the inspiration! 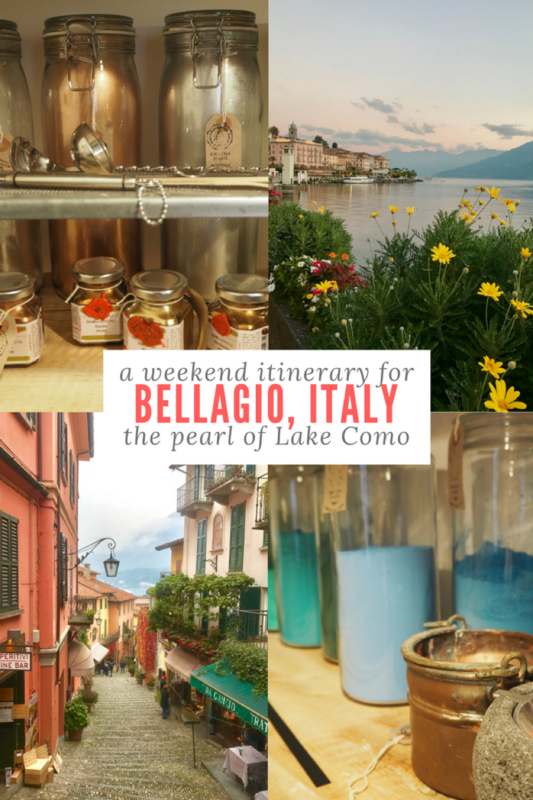 I totally suggest adding Bellagio to your Lake Como itinerary! Bellagio is beautiful and your hotel is right smack in the centre of things. I would stay there as well. I didn’t get to spend the night here in Bellagio though but had a gorgeous lunch at the other side of the peninsula. We were just walking aimlessly and we followed this less travelled narrow path that led us to the other side. There we saw this lovely hidden restaurant with a terrace on the water called La Pergola. One of the best lunches and ambiance furing our Milan-Como trip. I loved that path! The city on the other side was called Pescallo, I know exactly the restaurant you’re talking about! I wanted to include that in this article but felt it might take away from the spotlight on Bellagio. THe best part about Bellagio is that you don’t need to do more than a day trip to see the whole little village but if you do stay longer, there’s still new things to do/explore. Argh I know all about train strikes in Italy! I got stranded in Florence last summer due to one, but hey, Florence was a great place to be stranded. 😉 Lake Como looked gorgeous the afternoon I spent there in the pouring rain. I’m glad you had some nice weather and found great activities! Italians really do love their train strikes LOL. Florence is my favorite big city in Italy so I totally wouldn’t mind being stranded there, either lol. So gorgeous!!! I love the lighting over the water. Looks like you had such a great time 🙂 I was in Bellagio about 5 years ago and loved it! I had the BEST time!! I wouldn’t trust anyone who says they don’t like Lake Como, or any of Italy for that matter. The back streets are my favorite! Everything is so colorful and just looks straight up RELAXING 🙂 Hoping to hit up Bellagio when we do Italy next year! 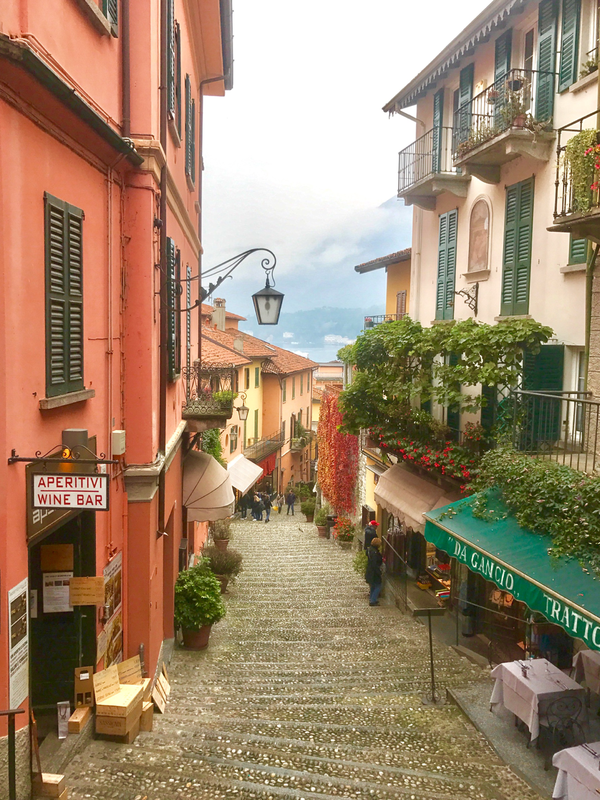 I HIGHLY suggest adding Lake Como, and specifically Bellagio, to your Italy itinerary! Where else are you planning to go?! I highly suggest adding Lake Como to an Italian itinerary! You don’t even necessarily need to stay there over night to absorb the beauty of the region! This looks like so much fun!! Your photos are really amazing! 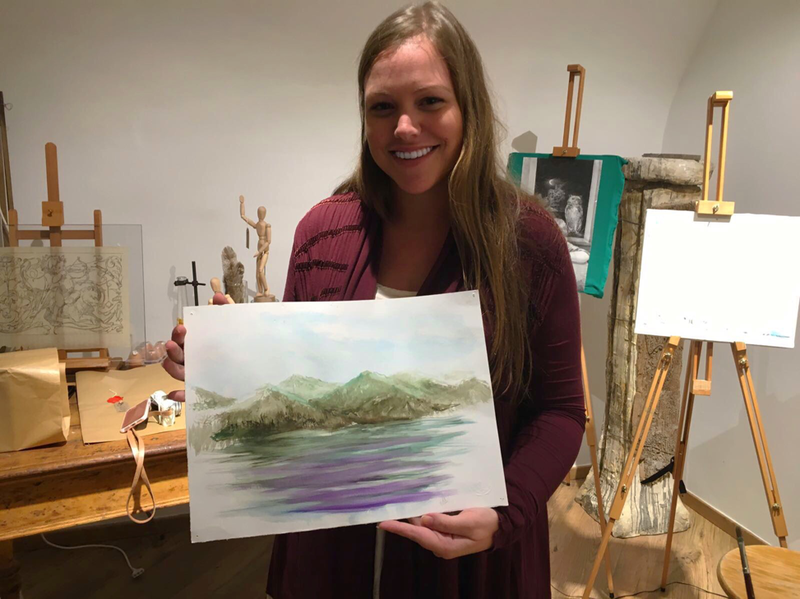 Thank you Jackie for the beautiful review and for choosing our art experience. We hope to see you soon in Bellagio! ? Thank you Francesca! I hope to return to Bellagio this year!! Thanks Morgan! 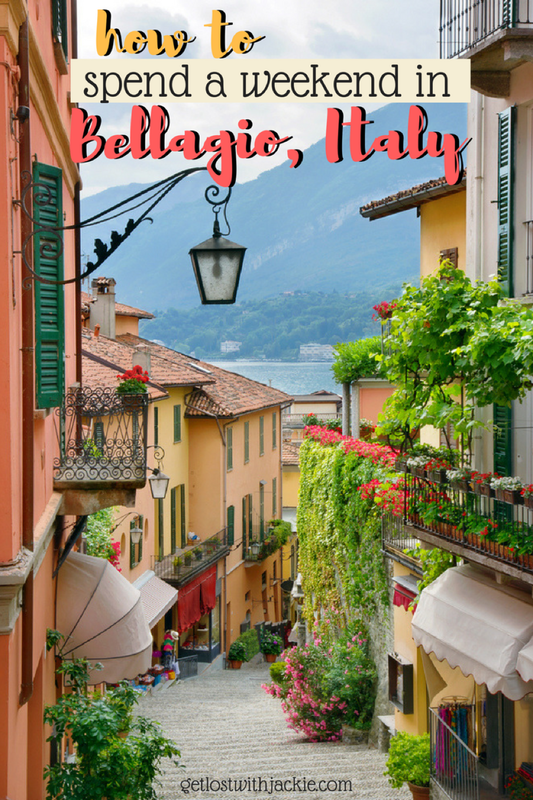 I totally think you should add Bellagio, and Lake Como in general, to your Italy list! Such a stunning area of the country. What an amazing post, Jackie! Very educational. I am inspired to visit Bellagio! Thanks so much Agness! I hope you get to visit Bellagio! Hello, I’m traveling to Bellagio in Sept. where did you take the art classes? Thank you! You can find them at http://abeleexperientiaartis.com/ ! Where is that famous street located and/or what is the name of it? Your photo is absolutely beautiful. It’s located in the center of Bellagio! I’m not sure of the name. Thanks for the info. My family and I are planning for 2-3 days in Belagio next summer ’19. Would you recommend staying as close to the middle of town as possible or do you think it would be too busy during the summer? And did you visit any other towns located on the lake while you were there? Thanks! I think it would be a bit too busy during the summer! 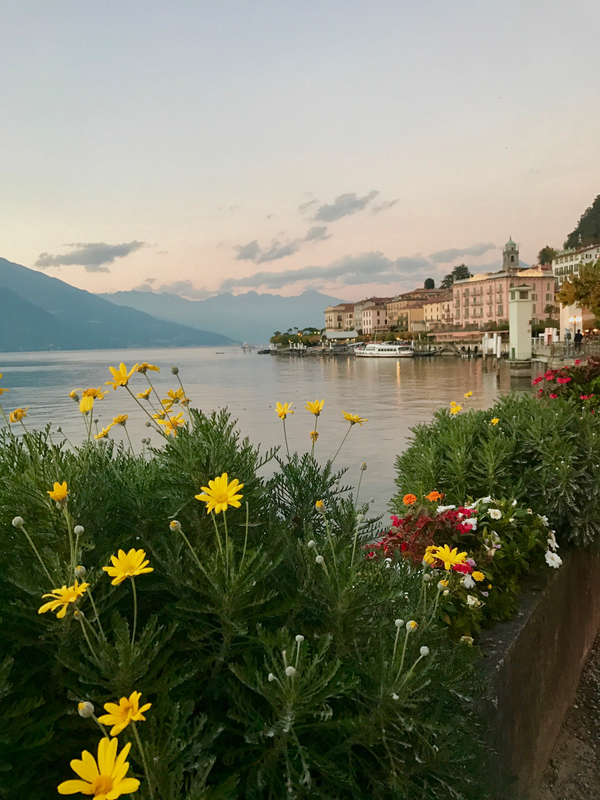 Check out my other article about the city of Bellagio on Lake Como to give you a better idea about the surrounding area. I’d definitely see Varenna if I were you and get in touch with Mich at Bellagio Water Sports!